You are here: Home > Rumor: T-Mobile Stores Receiving Nexus 4 Inventory As Early As Tomorrow? 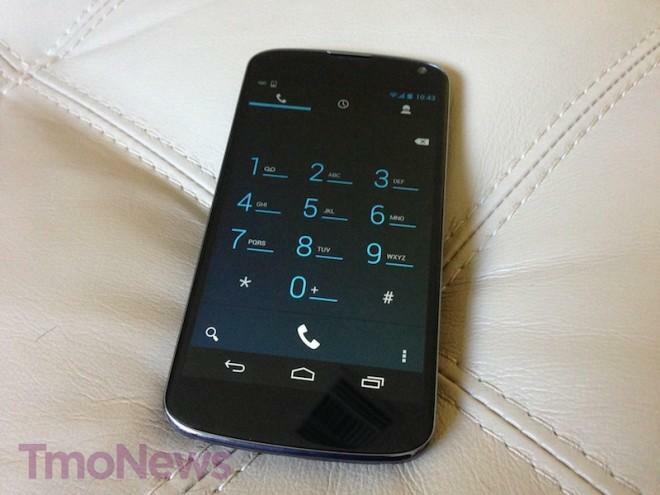 Rumor: T-Mobile Stores Receiving Nexus 4 Inventory As Early As Tomorrow? We’re chalking this up as a rumor until we can get more confirmation, but I’m getting word that T-Mobile stores will begin selling the Nexus 4 as early as tomorrow. That’s not to say that all stores will receive inventory right from the start, but with T-Mobile expanding the number of stores selling the Nexus 4 — we expect those sales to begin as early as tomorrow. For now, we’ll chalk this up firmly in the rumor category, though I can confirm some stores have received their Nexus 4 demo devices with a note that says sales can begin tomorrow. We’ll update the post as soon as we know more. Not necessarily but it would be sorta messed up that they get t-mobile their stock before play store customers. Though T-mobile customers pay more so I would be able o see why they have priority but principle priority is first come first serve then everyone else follows. I hope this doesn’t mean tmo will start blocking tzones on nexus 4.. It seems to me that IF it’s possible to purchase at the play store in the next 30 days or so, then there is absolutely no point in purchasing this phone from TMO. I wish GOOG would be a little more transparent about when we’ll see at the Play store again. Retail stores were told last Friday that all store would be receving demos soon and all winter marketing says its coming soon. not a rumor full retail launch on the 9th..inventory will prolly be spotty but will be a full nationwide retail release. I love this phone. I purchased from Google. The battery life is amazing, HOWEVER. Be aware that sometimes it doesn’t charge normally, or very very slowly. There have been a few times I took it off the charger it was plugged into all night, and within an hour or so noticed it was down to 14% or similar. There are several reports in webdom about it, some say it’s the LG power adaptor (would not surprise me), some say the battery. Google will not/cannot send you just a replacement power adaptor so they swap the device for a new one. Google is great in their handling of these swaps and assured me they send new not refurbed devices. (something you may wish to consider if you’re thinking of getting one from TMO since carriers usually give you refurbs as a warranty swao if not mistaken). Anyway, before I swap mine for a new replacement, I’m trying the little iPhone power adaptor. The print on it is nearly microscopic but I believe it is rated the same in terms of amps/voltage. I’ll give it a couple days or so to see how it performs. Google said that they believe it’s a bad battery and who knows, maybe the initial batches of these batteries are questionable. But on another note, this raises the issue in my mind that since TMO is carrying the Nexus 4 now, I would think you can get replacement power adaptors from TMO stores, or online. Which might be a nice option for some. Or buy a similarly rated adaptor that IS NOT LG. I highly recommend the Nexus 4. Stock Jellybean is elegant and works beautifully. if you think battery life is that good, try a samsung note2. that is a really good battery. this one is decent. i have both phones. obviously i dont think you would get them and not sell them??wtf?? so how much is it OFF CONTRACT from Tmobile stores? What I dont understand is why TMO is charging $499 for this phone. Also is TMO going to be adding their bloatware to it?? G-d I hope not. I ordered one a week ago throught tmobile . It was time for an upgrade so i call asked for customer loyalty and got a deal you would not believe( 200? ) (100? )(NOPE) if i put the price i got there would be a lot of mad people.Also if you check XDA you will find that tmobile nexus 4 has no bloatware and if you really want wifi calling there is a way!! I only hope is if the stores get them that mine is on the way !!! Oh i’m still waiting for the phone to ship but i was able to have the rep place my order.Told them that i was ready to leave and try att. they look and seen how long i have been with them and gave me a deal. I called a T-Mobile store today and they had 2 in stock, so sounds like they are selling them now. t-mobiles customer service is shipping the nexus 4 i think. i ordered my phone 1/7 and it was back ordered till today.i just got the tracking today. i cant wait! Me too! I haven’t refreshed TmoNews this much since the G1 preorders! I can finally stop lol. Well, I originally ordered on the 21st of December, but my plan was so old it had to go through management. Finally went through 31st and backordered 1st. Haha, I know right? Check out the Parcels app on Android, it’s pretty nice and you can set it up to keep checking every 30 minutes. Bought two from Google a couple months ago, no waiting for TMO and more cost effective. Best value, activation SIM kits were nearly free at the time from TMO, switched to monthly 4G on both phones saving $100/month compared to previous family plan. At that savings, phones will be paid off in just over 5 months. Best Android phone I’ve ever owned upgrading from the original Samsung Galaxy S, S 4G, S II and S III. No waiting for OS upgrades from carriers any more either, awesome.